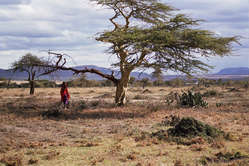 Many of the communities that Survival works with are hunter-gatherers. Hunting is more than a way of life; it is part of their identity. Some tribes identify themselves as hunters of specific species. 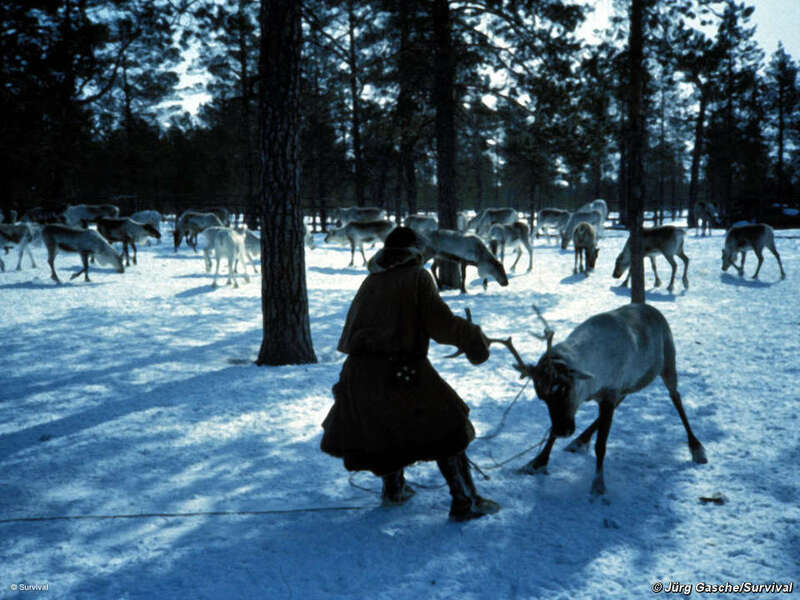 The Khanty of Siberia are reindeer hunters. 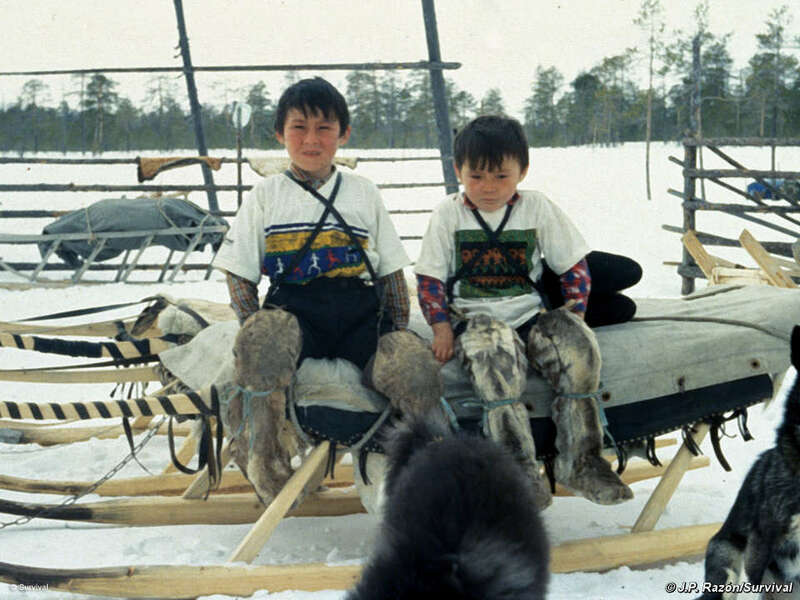 They use reindeer skins for clothing and shelter, meat for food and bones for knife handles. 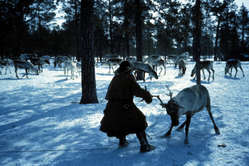 Their connection to the reindeer is vitally important to them as a people. The animals and everything that I have eaten from the land has moulded me. Many tribal societies have totem animals with which they have a kinship and which they do not hunt. Other species are hunted specifically for ceremonial, health or spiritual reasons. This connection to specific animals has often resulted in tribes carefully protecting their environment to ensure that there is a plentiful supply of the animals that they depend upon. In the face of outside pressures, such as influxes of settlers, “development” projects such as dams and oil exploration and the increasing risk of climate change, this fundamental relationship comes under threat. Myths about tribal people and hunting abound. British parliamentarian, Baroness Tonge, for example, claimed that Kalahari Bushmen were hunting using guns and 4×4 vehicles. But government officials have admitted that the Bushmen do not hunt with guns and there is no evidence that their hunting is unsustainable. Hunting by tribal peoples on their own land has been severely restricted in many countries without evidence that they are reducing the populations of the animals they hunt. The Hadza of Tanzania nearly lost their hunting rights to a safari hunting company. Controlled hunting for profit is often more acceptable to governments than hunting by tribal peoples for their own needs. When they are banned from their land by safari hunting companies or thrown off their land by settlers or ranchers, the impacts are severe. Tribal people are accused of “poaching” because they hunt their food. And they face arrest and beatings, torture and death, while fee-paying big game hunters are encouraged. Conservation areas, such as national parks, and conservation regulations in many countries outlaw hunting of specific species and in particular areas, usually without consulting the tribal communities who will be most affected. In January 2010, the Canadian government banned caribou hunting in an area where Dene tribal people harvest around 6,000 caribou a year to feed their families. Today my little girl brings home food from the garbage dump so I can eat. Alternative sources of protein and iron are both more fatty and more expensive. Diabetes is a major problem among the Dene, who have already suffered due to forced evictions from their homelands. Where the issue of indigenous hunting becomes particularly contentious is regarding species that are considered special, such as polar bears, seals and whales. To many Arctic peoples, hunting these creatures is an integral part of their culture. 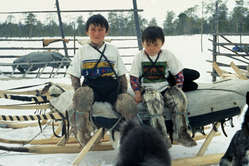 Khanty children of Siberia on a sleigh. Charles Johnson, an Alaskan Inuit, said "When I was a child, it was forbidden to speak our language, to do things like dancing because missionaries said we were worshipping the devils.